Plants that bravely bloom in winter come into color when we need it most, so take advantage and plant plenty. Many gardeners are familiar with late-winter bloomers like forsythia and crocus, but Oregon State University Extension experts suggest planting less-common trees, shrubs and herbaceous plants for all eye levels of the garden. Some of the boldest are witch hazel, a small tree or large shrub with buttery yellow to red flowers that typically bloom in December, January or February in Oregon. Two species – American witch hazel (Hamamelis virginiana) and Ozark witch hazel (H. vernalis) – are natives, while H. japonica and H. mollis are from Asia. 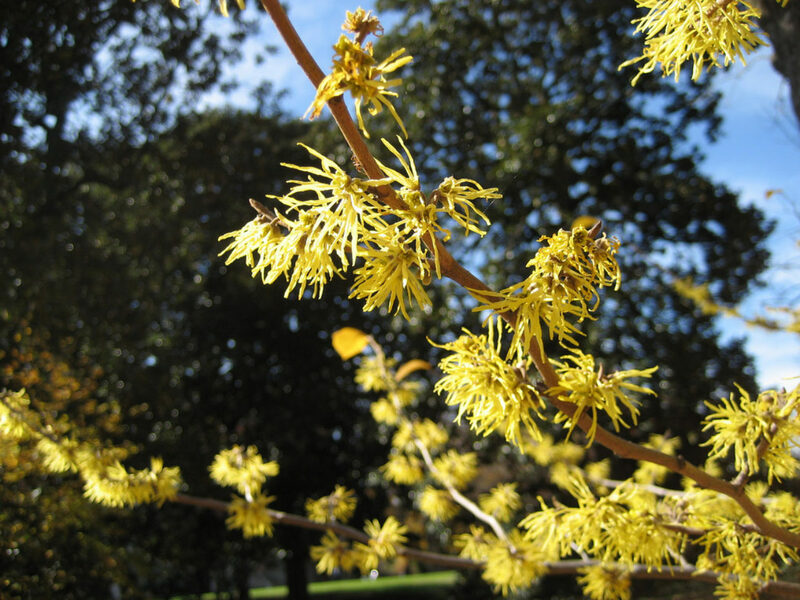 Perhaps the most popular is the Chinese witch hazel (H. mollis) with its bright yellow flowers and colorful fall show. Hybrid forms also are available, such as H. x intermedia ‘Arnold Promise,’ ‘Jelena’ and ‘Diane.’ Plant witch hazel in full or filtered sunlight and provide summer irrigation for best success. They are hardy in USDA Zones 5 or higher. For blooms in December and January, look for another small tree or large shrub, the sasanqua camellia (Camellia sasanqua). Unlike the more familiar Japanese camellias, the sasanqua camellia blooms earlier and grows in an open form. Like its more common relative, it has been bred for many colorful flowers, from pure white to pinks and reds. This evergreen shrub is hardy to USDA Zone 7; it prefers rich soil with regular summer irrigation. Another large shrub called wintersweet is known botanically as Chimonanthus praecox. As the name suggests, this January bloomer produces a powerful and sweet fragrance. Its flowers are waxy and light-to-medium yellow. Wintersweet grows to USDA Zone 6, making it suitable for much of western Oregon and Washington. It is deciduous, grows from multiple trunks, and prefers sun to light shade and regular watering in well-drained soil. For fragrance on a smaller scale, try sweetbox in the genus Sarcocca from China. Several species and hybrids are available, but the most common is sold as S. humilis or S. confusa. Though the flowers don’t make much of a visual impact, they are strongly fragrant and waft for yards on a winter day so plant this January-February bloomer near a walkway or doorway you use often. The flowers are followed by attractive, shiny, black berries that persist for much of the year. These evergreen shrubs, which grow 3 to 5 feet tall, prefer part shade, rich soil and regular irrigation. They are hardy in USDA Zones 7-9. Another shrub from China is winter jasmine, Jasminum nudiflorum. It blooms off and on between November and February. Some forms are hardy to USDA Zone 6, making it suitable for most of western Oregon. This species is not fragrant, but has bright yellow flowers and is deciduous and almost vine-like. Hardy cyclamen (Cyclamen coum) flowers in November or December, followed by colorful variegated leaves. Flowers are a medium to deep pink, and each flowering stem uncurls like a corkscrew as it emerges. The plant grows from an underground storage unit called a corm, which is often sold with fall bulbs, but many nurseries offer them as potted plants as well. Make sure to shop by species names as less hardy species (often called florist cyclamen) also are available. This species comes from Middle Eastern countries and is hardy to USDA Zone 5. Commonly called Lenton Rose or Christmas rose, hellebores come in several colors and foliage forms. They are sturdy and grow 1 to 2 feet tall, with large flowers in white, yellow, green, pink or purple. Some of the species are hardy to USDA Zone 4, making them suitable for gardens throughout most of Oregon. In most places, you can expect blooming to begin by late February.